Anisotropic phase separation has been used to fabricate an electrically switchable microlens array from nematic liquid crystals. Nematic liquid-crystal-based microlens arrays have been built with diameters of similar to400 mum and natural focal lengths as small as 1.6 mm. The focal length of each microlens in the array can be changed in milliseconds by an applied electric field. These devices, which have no internal substructures to scatter light, offer higher efficiency and greater light throughput than polymer dispersed devices. 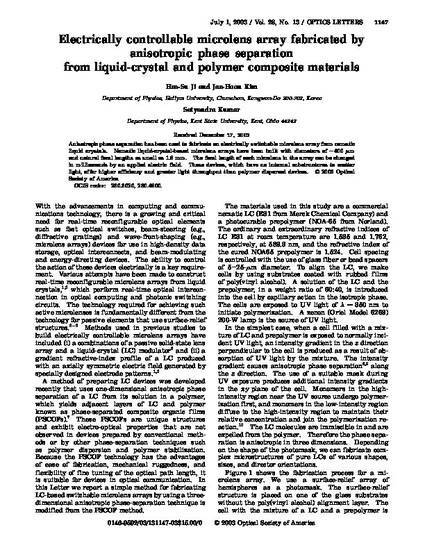 This paper was published in Optics Letters and is made available as an electronic reprint with the permission of OSA. The paper can be found at the following URL on the OSA website: http://dx.doi.org/10.1364/OL.28.001147. Systematic or multiple reproduction or distribution to multiple locations via electronic or other means is prohibited and is subject to penalties under law.